Did you know that Jackson Hole is part of the largest protected wilderness in the Lower 48? A patchwork of national parks, forests and wildlife refuges preserves our valley's unique habitat. And the good news? You can visit each and every one. Jackson Hole wouldn’t be Jackson Hole without its abundance of public lands. Boasting two awe-inspiring national parks and vast Bridger-Teton National Forest, the greater Jackson Hole area’s 97% protected acres serve as a living testament to America’s conservationist legacy. In fact, the combined acreage of the bordering parks and forests represents the largest protected wilderness in the Lower 48. Grand Teton National Park and Yellowstone are neighbors with surprisingly different backgrounds. The world’s first true national park, Yellowstone opened its gates in 1872 after a single act of Congress. Grand Teton National Park, however, required three acts of Congress and extensive negotiations between ranchers, the Park Service and conservation-minded members of the Rockefeller family before taking its current form in 1950. Appropriately enough, the Wilderness Act of 1964 was conceived within the current borders of Grand Teton National Park at the Murie Ranch. Signed into law by Lyndon Johnson, the Wilderness Act claims responsibility for more than 100 million acres of protected land. Cost: While you’re exploring national forests, you can leave your pocketbook at home: entrance is free, and campsites can often be free as well. The forest’s three wilderness areas are the Gros Ventre, Bridger and Teton Wilderness. These are remote zones and travel is restricted to foot and horseback, though hunting is allowed during designated hunting seasons. The six ranger districts are the Big Piney, Buffalo, Jackson, Kemmerer, Greys River and Pinedale Ranger districts, and should be contacted individually for more information about local recreation opportunities and regulations. Their contact information is easily accessible at the Forest Service’s website: fs.usda.gov. State licenses are required for hunting in the Bridger-Teton National Forest and special permits are required for gatherings of more than 75 individuals. Unlike the National Parks, visitors are free to keep any antlers found in the BTNF after May 1st of each year. If you have a little extra time on your hands, you should scoot over to Idaho to explore the Caribou-Targhee National Forest and Jedediah Smith Wilderness. They offer a similar experience of truly remote, pristine wilderness on the western boundary of the Greater Yellowstone Ecosystem. Hemmed in by Grand Teton National Park and the Bridger-Teton National Forest, the National Elk Refuge represents a singular conservation effort. Unlike its neighbors, the refuge is not designed to preserve opportunities for human enjoyment. As its name suggests, the elk refuge was designed to provide a wintertime habitat for herds of elk under siege by weather conditions and the migratory disruptions caused by the influx of settlers coming into Jackson Hole. Jackson Hole residents began lobbying for the creation of the elk refuge following the local elk herd’s decimation during a particularly harsh winter in 1910. In 1912, Congress approved the lands as a “winter elk reserve” and by 1940, the reserve had morphed into the National Elk Refuge, as it is known today. Let's go! The elk refuge offers premium opportunities for wildlife viewing and photography of wildlife ranging from bighorn sheep to swans and of course, elk. A multi-use gravel road runs along the refuge’s eastern boundary, allowing visitors to get a closer glimpse. Cars, bikes and pedestrians are confined to this roadway and are not permitted off-road. Entrance via road is free. In order to control the animal populations, hunting of bison and elk is allowed in the refuge each fall. Interested hunters must apply for special refuge permits in August or September for elk and receive bison tags from the Wyoming Department of Game & Fish. Fishing, too, is permitted within the refuge, though limited to Flat Creek. National Elk Refuge Sleigh Rides Just a short distance from the center of town, you can join an elk refuge sleigh ride from the North Cache Visitor Center. After being bundled up and whisked over the open meadows of the refuge, you’ll enjoy the once-in-a-lifetime experience of being surrounded by a herd of wild elk, with your sleigh driver and guide sharing information about the refuge. For more than 100 years, thousands of elk have wintered here. Elk aren’t the only wildlife you’ll see, either: Eagles, coyotes and even wolves can sometimes be spotted, too! The geysers and peaks encompassed by Grand Teton and Yellowstone national parks pair otherworldly beauty with a smorgasbord of recreational opportunities. Costs: For visitors arriving by car, the Park Service charges $30 for a seven-day pass. Those entering the parks on foot, skis or bicycle are charged $15 for the same pass, and motorcyclists $25. Interagency Annual Passes—good for access to any national park—are available for $80, and a Park Annual Pass, good for only Yellowstone and Grand Teton, costs $60. Rules: Pets are allowed in both national parks, though not on hiking trails, and those interested in fishing, boating, snowmobiling, or overnight backpacking must contact the park service about special permits. Be sure to stop by one of the parks’ souvenir shops, as the removal of any flora or fauna from the park is strictly prohibited. Yes—that includes those cool elk antlers you found just off the trail. Encompassing six ranger districts, three wilderness areas and four separate mountain ranges, the Bridger-Teton National Forest is home to more untamed terrain than most states. But don’t let the national forest’s size intimidate you: There are spectacles aplenty for adventurers of all ability levels. Just 33 miles south of Jackson, Granite Hot Springs redefines the term “dreamscape.” At the base of a double-decker waterfall on Granite Creek, geothermally-heated waters burble up from deep in the earth’s crust to form natural hot tubs. Nearby, a rustic swimming pool constructed by the Civilian Conservation Corps in the 1930’s harnesses these natural springs and provides the perfect respite after a day outdoors in both summer and winter. One of Jackson Hole’s signature landmarks, the Sleeping Indian, lies within the boundaries of Bridger-Teton National Forest as well. Technically known as Sheep Mountain, the Sleeping Indian rises on the horizon just north of the elk refuge and can be recognized by its uncanny evocation of a Native American chief in slumber. Look for the tip of his nose, hands folded across his breast and the rocky folds of his war bonnet. The Bridger-Teton National Forest is also home to Wyoming’s tallest mountain, Gannet Peak, which rises to 13,804 feet above sea level in the Wind River Range. Along with the Winds, the Gros Ventre, Snake River and Wyoming Mountain Ranges all lie within the boundaries of the Bridger-Teton National Forest, not to mention the wild and scenic rivers that many of the ranges are named for. For mellow-minded visitors, the Wyoming Centennial Scenic Byway runs through the forest and offer spectacular roadside views of the Northern Rockies. 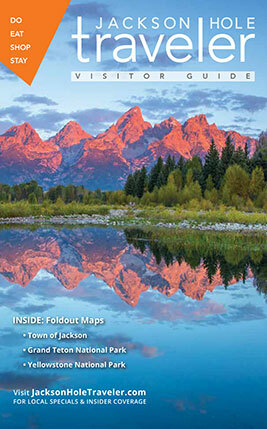 The Centennial Scenic byway runs directly through Jackson Hole on its path from Pinedale to Dubois. It’s easy to forget that the geologic forces responsible for creating Jackson Hole’s landscape are still at work. Hence, the region’s legacy of conservation remains extremely relevant in the present day. The Jackson Hole Land Trust presently manages more than 24,000 acres of protected land and as recently as 2008, the privately donated lands that comprise the Laurance S. Rockefeller Preserve opened to the public. Many nonprofit and grassroots organizations pursue conservationist goals in the Tetons and beyond.